While listening to the online town hall meeting held my candidate Michel Martelly yesterday, I found out that there is actually a name for it. This enables the project proponent to recover its investment, operating and maintenance expenses in the project. Say for example, a big corporation like MARIOTT wants to develop an beach area in Haiti by building a resort. The government would allow them to build it, run it for say 20 years, then hand it back to the government. Something like that, I believe, is a good way to develop our coastal areas... after all... who among us has the pockets deep enough to build such a gigantic project. Let's not forget the number of jobs that would be created and other countless side jobs that would be created as a results of the increased activities in that area. Also, the positive promotion that would come out of it for our country. It is true that Jamaica is a poor country, but there is this area that the locals call "tourist town" and because or it, I constantly see commercials on television in the United States singing "Come to Jamaica and you will be all right!" « Haiti Facebook Town Hall Meeting Today, Did You Know? It's very nice, I hope to see a project like that, but I do not believe that will happen.The world for itself is in trouble right now and tout moun ki gen cob yo comance fe bac nan yon seri de bagay, yo pa investi nan anyen paske gen yon pe lakay tout moun pou des rezons inconu.Pou mwen tout sa ou we neg ap di de Haiti, ke se comunote internasyonal, candida a la prezidans, senate,depute, ancien prezidan, prezidan e zot tout se blof pou yo ka rive nan tet peyi pou al siyen papier bay neg ki rich pou ka vin pran ter d'Haiti pou yo pou regle prop zafe yo san intere pep pa ladan.Men yo panse, se sel yo menm ki interligent dan le monde, le yo pote ed bay mounn le ou recevoi kec sac duri kek gren poi e manteg sa pral prouve yo gen capacite pou dirige pep epi yap vin prezidan yon nation.map di tout neg sa yo yo wrong e yo mal panse, si se te consa Haiti tap gentan loin epi plu bel peyi o monde. I will say go for it. Just imagine if after Duvalier we had 5 resorts in every coastal on Haiti by now the Government will have own them and the labor for Haiti could have been $2.50 an hour instead of day. Because tourist will have visit Haiti with security in place. The BOT Financial Project is a very good approach to resolve the problems. Presently, Haiti is in no position to attract foreign investors. It has to regulate this volatile political climate that is plaguing the country. And this is up to the politicians and the Haitian people to arrive at the decision to stabilize these political mishaps. that would definately work in Haiti's favor especially with the subject of oil and natural gas in Haiti. It seems like no one wants to talk about it when it's all over the internet why won't any body mention oil and natural gas one of the largest reserve in the world underneath port-au-prince why are we scared to talk about it? 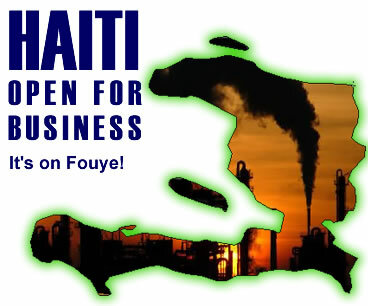 let's get foreign companies to come and drill for our natural resources and develp Haiti. I have seen it done in other countries, and the government cannot do it all. I do not see the companies here taking over the US government, because they provide benefits for their employees and I do not understand where you coming from with your state of mind. I have visited all five continents, south america, and the islands. In other words, you waant the companies to play the role of government by providing the services Governments and/or living wages shouldnprovide. I like the idea very much, and would rather private Haitian investors take over after 20 years. I would like to add a couple requests, and would require that the company builts all the roads in the area. We had Reynolds extracting "aluminium", and I believe the company found gold or perhaps diamonds.